Or : Some games should be seen through an alcoholic haze. Drive and park up near the Welly. No beer today. See post re pubs yesterday (King Street ventures up the hill) for a possible explanation. I hate the notion of a romantic FA Cup. It is nothing like any romantic notion I have ever had. Today all I have done is fallen a little more out of love with my 50 year old dalliance. 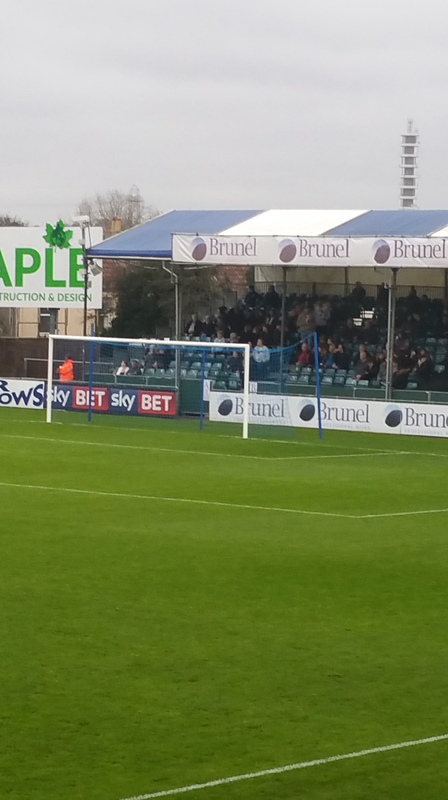 In all the days since that first game in 1965 (Exeter at home, 16th April, 1-1 draw, in the pouring rain) Rovers have never lost at home to a non-league team. Indeed, before this game the match day programme rather confidently boasted Rovers our record V non-league teams since the 1920s as P 27 W 23 D 4 L 0 All I could recall is in the last year we have lost at home to Bath City in the FA trophy and Chesham United yesterday. I arrived early. I was up for this. I was convinced today, much like the game against Bath last year would mark some sort of turning point. Last year it did as we lost and recriminations were sharp. This was to be the comfortable win that kick started the home win part of a promotion season. 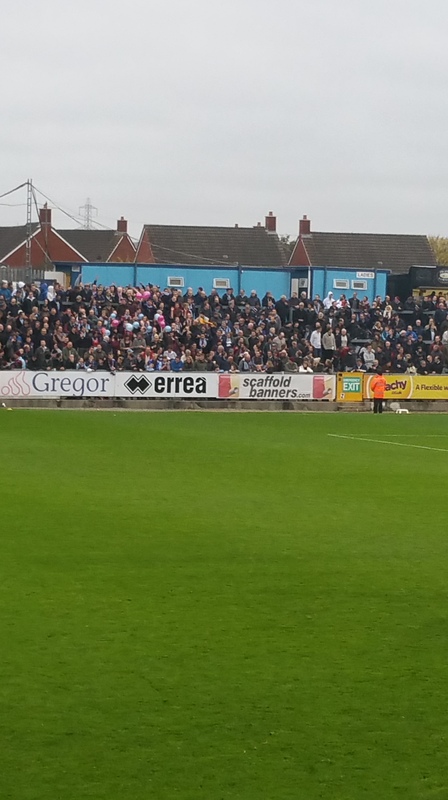 Rovers have a home record in all competitions of P10 W 2 D 2 L 6. Those stats really do tell a story. Rovers should expect to have more of the ball. They should be able to play at a higher tempo, for longer and with more skill than a team that play four leagues below them in a very flexible pyramid. At times this was the case. For much of the game it was one way traffic that ended with the queue travelling M4 like towards that M25 car park. The M4 is fine in the middle of the night but almost pedestrian in the rush hours. If you have ever tried a detour off the M4 then you might well have encountered Chesham as the worst of all one road in and one road out towns. My memories of Chesham involve meeting printers up leafy lanes and using the Football club changing rooms before walking half a mile through the streets to play in or referee Rugby games in their changing room less park. I have wasted light years on their not so cute inner ring road system travelling to or from work in nearby Wendover. I have suffered Chesham frustration syndrome before and it came back yesterday in bucket loads. Patience is everything and in recent weeks that virtue is an ever increasing scarcity. When people suggest Chesham were the better side it is just not true but 25 shots to 6 is out of proportion to the possession statistic. We should have won and won comfortably if this fact is any indicator. The non-league side managed to get 50% of their shots on target and one in 3 went in. The professional side managed only 40% on target. This is nothing new. This set of forward as needs three touches to get a shot away and seem to think goals can be scored by shooting through defenders. The Chesham keeper did well but so too did the Rovers midfield and defenders who created 25 opportunities in 90 minutes, one every 4 minutes if one allows for the considerable extra time. Here is another statistic. Of the 22 goals scored this season in 19 games the scorers are Taylor 6, Harrison 5, Easter 5, Bodin 3, Sinclair 1, Brown 1 and Parkes 1. The Rovers could have a corner every minute rather than one every 6 and the team still would not score from corners. Traditionally defenders add to the scoring mix from corners. I am sure opposing sides don’t bother marking McCrystal or Lockyer or Parkes (when he plays) because a cross to them equals a guaranteed goal kick. One goal from our usual midfield is frankly embarrassing. By the end of the game the Chesham players were out on their feet. They were going to the ground from cramp in multiple swathes. One would expect the team under pressure to commit the most fouls but what is going on with this one. Someone hadn’t done their homework that’s what was going on. I was told in midweek that the Chesham team have form in the intimidation / falling over department. They are coached by Barry Hayles for goodness sake. It is called a professional foul for a reason and the Chesham Boys were very good at getting at the referee. It is not a carp because I blame the Rovers staff for being so unprofessional in falling for it. It wasn’t as if the Chesham team offered any real collective pressure that required desperate tackles. Most of the 18 fouls came from nudges in the back or ill-timed tackles. Surely it wouldn’t be that dangerous to be cute and stand off the salmon like diving of the Chesham front two. And so to the bottom line. This result will be a turning point. As Lord Powell will say “Mark my words,” Congratulations to the Chesham Boys. They will live on this for some time and so would we if we had, say, beaten Sheffield United away in a parallel draw. I must also add a line about Mr Barry Hayles. A simple statistic. He came on a bit before the end. He touched the ball four times. He made one pass and lost it three times. If you read the comments on the forums he was apparently world class. That is the romance of the cup. It gives watchers some curiously romantic goggles to wear. I gained very little entertainment in the game or the day. I went home decidedly miserable. I made the mistake of looking at the Rovers websites. The usual suspects were quick to get their knives out and reiterate their pet hatreds. We lost a game of football. That is all. Most, no doubt, will not be watching their next game away from home but one just hopes a few might go along to watch and support their local team at home. I wondered if some of the boys I taught were in the crowd. The likes of Liam Moore might just have made it a fun day out. No doubt some really support Wycombe or London Premier Clubs. They looked as if they were having a great time. I don’t hate them, I wish them well. I am not in love with the FA Cup. I hate it more every year. Southend away on Wednesday in the JPT. Lord Powell and myself will be looking for a decent stop off on the way. That might need a 1 o’clock departure as Southend itself has its own real ale cul-de-sacs to avoid. A disappointing result but a very good Sunday lunch in The Annexe beforehand. For what it’s worth my M.O.T.M. was Lee Brown. At least I now know I can buy a ticket to see 60’s legend Ronnie Spector at The Colston Hall on 4th December without worry that it’ll clash with a football match! Drifters rugby club v Bletchley for me a possible.